Fences is a story about broken dreams. Two-time Academy Award-winning Denzel Washington co-produced, directs and stars in August Wilson’s Pulitzer Prize-winning play Fences. Theatre buffs will delight in the potent big screen adaptation of August Wilson’s Pulitzer Prize-winning play, driven by crackling dialogue and strong characters, allowing us to take an emotional journey into the lives of bruised souls seeking ultimate redemption. A family drama set in the 1950s, Fences ran for 525 performances on Broadway, the longest residence there for any of Wilson’s plays, and collected the trifecta of playwriting honors: a Pulitzer Prize, a Tony Award, and a New York Drama Critics’ Circle Award. A 2010 revival on Broadway, starring Denzel Washington and Viola Davis, won Tony Awards for best revival, best actress in a play for Davis, and best actor in a play for Washington. Now, of course, Fences will become the first of Wilson’s plays to be made into a feature film, directed by Washington and starring him and Viola Davis. During his lifetime, Wilson received two Pulitzer Prizes, for Fences and The Piano Lesson, and an astonishing eight Best Play awards from the New York Drama Critics’ Circle. (Only King Hedley II and Gem of the Ocean went unrewarded.) All his works except Gem of the Ocean and Radio Golf have received major revivals on or off Broadway, and his dramas are a staple of institutional nonprofit theaters from coast to coast and indeed across the Atlantic, where Britain’s National Theatre recently mounted an acclaimed production of Ma Rainey’s Black Bottom. It went on to win the Olivier Award, England’s equivalent of the Tony. Wilson wrote his initial draft of the screenplay in the late 1980s and continued revising and refining it until his death. With Washington helming the film, Fences also posthumously honors Wilson’s longstanding desire that an African American direct the screen version. I related more to Cory [played by Courtney Vance] because I was closer in age to Cory. And I remember how fragile Mary Alice [as Rose] looked compared to James Earl Jones. I’d seen James do Othello with Christopher Plummer on Broadway. And I’d seen him do Oedipus the King up at St. John the Divine. In fact, I went backstage. He didn’t know me, but I guess he sensed I was a young actor, so he let me hang around. He was meeting people, and I’m walking around looking at his makeup, and he had all of his rings from the play. I started putting them on, and you know James is a big man, so the rings were like bracelets. I just remember how big he was and that voice, that power. What about his performance as Troy? It was James Earl Jones, so you know I’m going to see it. My career started in the theater. I was one of those Lincoln Center Theatre snobs. We weren’t thinking about movies. I was going to be James Earl Jones one day, hopefully, and make $650 a week and do Othello. And, in fact, my first two roles were the Emperor Jones [by Eugene O’Neill] and Othello. So I was thinking about James and Paul Robeson. That was at least the benchmark to shoot for. On the one hand, for people in theater and literature, August Wilson is unquestionably among the greatest playwrights in world history. And yet, a lot of people will have this film as their introduction to Wilson’s entire body of work. What do you hope they’ll take away from it? Were there things you were able to use from the stage production? When I steal, I steal from the best. I mean, the shape of the film was fundamentally the shape that we had found or at least the characters that we had found doing the play with [director] Kenny Leon. Now we could take it inside the Maxsons’ house. It’s not all in the backyard, the way it was on stage. We go to different places. But other than obviously Jovan Adepo [as Cory] and Saniyya Sidney [as Raynell], the little girl, nobody else had to catch up. Once I got there and saw it. I didn’t know what the Hill was until I got there and started seeing and meeting the people. I wanted to be in Pittsburgh, no question, on the Hill. The neighborhood, though, has changed a lot since the 1950s, when most of the film is set. Entire blocks of homes are gone. Businesses have shut down. What were the challenges getting the Hill in 2016 to resemble the Hill in 1957? The area where August lived, the lower Hill, was gone. We went further up and we found some streets that were intact. Just take the bars off the windows and change the cars. 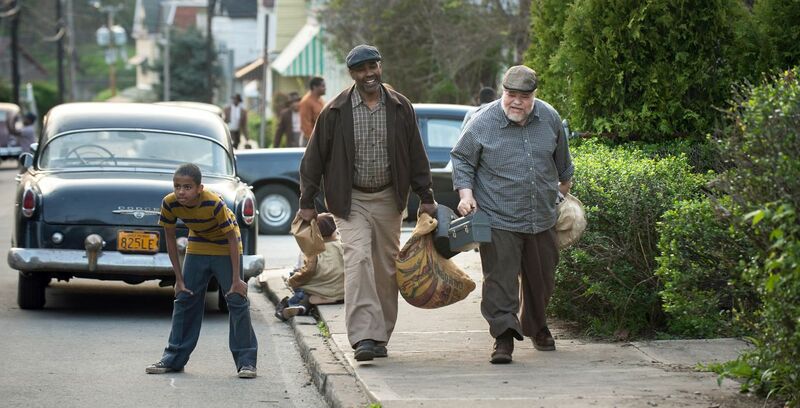 Denzel Washington plays Troy Maxson and Stephen McKinley Henderson plays Jim Bono in Fences from Paramount Pictures. Directed by Denzel Washington from a screenplay by August Wilson. Before we started this interview, you mentioned that you had a ritual of every day asking August Wilson—meaning, of course, the spirit or soul of August Wilson—what he thought of what you were doing. Fences is set in a very precise time—1957, with a final scene in 1965. Do you find yourself thinking of how it can speak to the present day? You spoke before about how the universal stems from the specific. In what way does this film hit universal chords? That’s what you do. You do what you do and then you see how it affected you or the feeling you got. I’m not trying to tell people what they should feel but, you know, August Wilson wrote a masterpiece, and God only knows how it affects people. And that’s the beauty of it. Come in, sit down, and we’ll find out or you’ll find out. I’m happy now that Fences goes to the masses. I was reading about how much it is taught in schools. So a lot of young kids may know more about it than our generation might. So to be a part of spreading the words of August Wilson is an honor and I take it seriously and I know it’s a responsibility. It’s part of our job, my job to, to share him with more people. So they’ll find out why he’s with the greatest ones. You’ve got Tennessee Williams, Arthur Miller, Eugene O’Neill, Edward Albee, August Wilson. I’m happy to do my part and to help share his brilliance with the world.